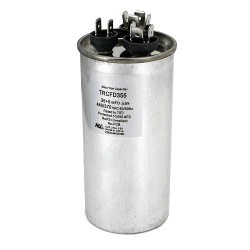 The capacitor is small but very powerful and is important for your AC unit to work properly. It’s like a battery, that swaps electrons between two conductive plates. Your unit cycles a lot, so they are turning on and off frequently. They are necessary for your A/C unit to start up because it takes a little bit more energy than just the homes electricity. Basically, they are designed to store energy and kind of jumpstart the unit. If recommended by a professional HVAC contractor like ourselves capacitors should be replaced to help prevent any breakdowns to the system or if your unit isn’t working it could be an easy fix for the technician. Capacitors are small, but they do play a big role and sometimes they fail. More often than not, they will eventually. Here are some reasons why they fail. Heat Exposure: Especially living in the valley of the sun we know about being exposed to heat. Now for capacitors being exposed to the heat for long periods of time it really takes a toll on them. So, make sure you can shade your unit as much as possible, so it spends fewer hours in the sun to maximize the life of the capacitor. Age: Usually a capacitor is designed to last somewhere between 10-20 years, but a lot of different things play a role in the lifespan of them, such as we discussed earlier, like exposure to heat, if the capacitor is undersized, or even if it was built with wrong parts, a number of things play into how long they will last, the good thing is capacitors are not that expensive. Voltage Rating: A lot of the time homeowners tend to find they have bad capacitors and take it amongst themselves to change them. Sometimes they pick the wrong one for their unit just trying to save a few bucks. It might seem like an easy fix but in reality, it’s best to have an experienced professional take care of it. Each A/C unit calls for a specific capacitor with a specific voltage rating and when changed themselves, some homeowners don’t always get the one intended for their unit. That can cause the capacitor to short or work even harder and shorten the lifespan of the capacitor. The wrong capacitor can even cause parts to break down and that can lead to system failure. There are many different factors that play a role in why a capacitor could fail over time, the biggest one here in Arizona is the heat. The capacitors just aren’t built to weather the heat like they used to. Heat can cause a capacitor to swell and burst, which leads to open circuit failure and no current will flow through it. There is also a closed-circuit failure, or a short, which will result in too much current flowing through it. Capacity failure will result in, either higher or lower capacitance value. Too much or not enough capacitance leads to system breakdowns. If your units not cooling it could simply just be a capacitor. To make sure your A/C unit is always running at its peak performance and to make sure you get the full lifespan out of that capacitor, be sure to routinely schedule preventative maintenance every six months, look out for the signs of a bad capacitor, and if all else fails, give us a call. We at SMW Refrigeration & Heating, LLC are here to help 24/7!